Smithrite has been offering organics recycling since 2005. Our program has proven successful throughout the years and substantially reduces the amount of waste sent to landfill. A wide range of compostable materials is accepted, from discarded food to by-products from food processing. Wheeled carts are the best option when the available space is too small for a front-end unit, or when smaller volumes of food waste are collected. Our carts are durable and designed for convenient organics recycling. We offer 32 gallon and 64 gallon carts. When our customers have limited space and require an enclosed, easily accessible bin with regularly scheduled pick-ups, our front end service is ideal. There are specific sizes available in front end configurations for organics collection. 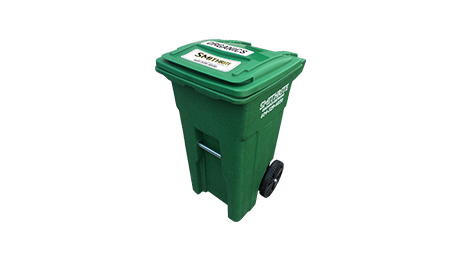 Front end bin rentals for organics are offered in sizes between 2 and 3 yards. A compactor unit can be used to collect large quantities of organic materials. Smithrite also offers maintenance services to help avoid odours and contamination. We can service customer-owned compactors or install a new one at the location. Please refer to our Educational Resources section, where you will find documentation on accepted/unaccepted items in each recycling stream, as well as general recycling guides and tips for each recycling process.